Sunrise to sunset, come see all of the reasons why we love this place. If you need a little "environmental Prozac", come to Bruin. I promise you'll get exactly what you need! Lake Bruin is a 3,000-acre oxbow lake, approximately 18 miles long and plenty wide. Once a part of the Mississippi River, it is a deep, clean lake, with depths of 60 feet in places. It is thought to be 1700 years old and was created when the river changed its course. Lake Bruin has been stocked with Florida, striped and largemouth bass, all of which are plentiful to catch. On Bruin, we have a slower pace, a live let live attitude. Whether you are on a sunset cruise or a jet ski looking for action, you will appreciate all the reasons we love this place. Our water sports are unsurpassed because you can do it all here on our wide-open lake. Lake Bruin is engaging and has a seductive beauty that draws you in, once here, it is hard to leave. We call it our "environmental Prozac". Good for the soul! We have a little of it all here. Our homes on the lake can run from rustic fishing camps and cozy cottages to luxurious homes with sprawling lawns. Whatever your needs are, I can help you find just the right place for you and your family. Exit 171 at Tallulah, go south on Hwy 65, 20 minutes to Newellton (blinking light) at 60-63 mph. Continue about 5-7 miles. You’ll see a sign saying “Welcome to Lake Bruin”. Turn left on Hwy 607, then immediately turn right or left on Hwy 605 depending on where you want to go. The Lake Bruin Grocery is about half a mile to the left if you need directions. Go to Natchez, then Vidalia, then Ferriday, then 5 to 7 miles after Ferriday you enter Clayton. Turn right onto Hwy 65 it’s a wide spot in the road - see sign that says Newellton or Tallulah). If you go over another bridge before turning right on Hwy 65, you’ve gone too far. Once you’re on Hwy 65, the next town is Waterproof, SPEED TRAP, slow down to 45 (or less) because you have revenue written all over you. 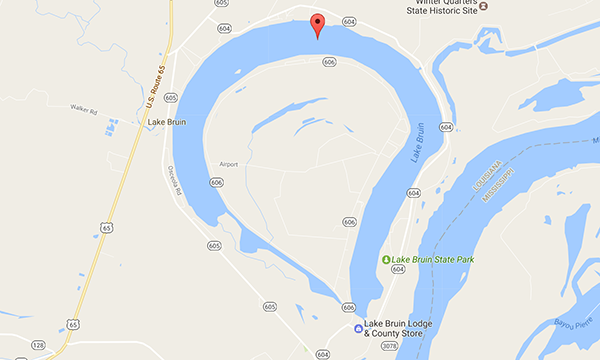 Go about 12 – 15 miles and you’ll see a blinking light, (another wide spot in the road) signs say to St. Joseph, Lake Bruin, Tensas Academy. Hwy 128. Turn right at blinking light. Go about 3 or 4 miles and you are in St. Joseph. Go into town, turn left on Newton St. and that turns into hwy 605. You will be one block short of the Mississippi River levee when you turn. Go straight for about 1 mile to Ken’s Corner convenience store. If you go left on hwy 605 you’re on the outside of the lake. If you go right on Hwy 604 you’re on the inside or “island” part of the lake.